BATON ROUGE – A week after a chaotic East Baton Rouge Metro Council meeting where members and citizens chastised each other over a decision to appoint a deceased councilman’s wife to his seat, one of the city leaders who extended an olive branch during the ruckus now faces a recall petition. 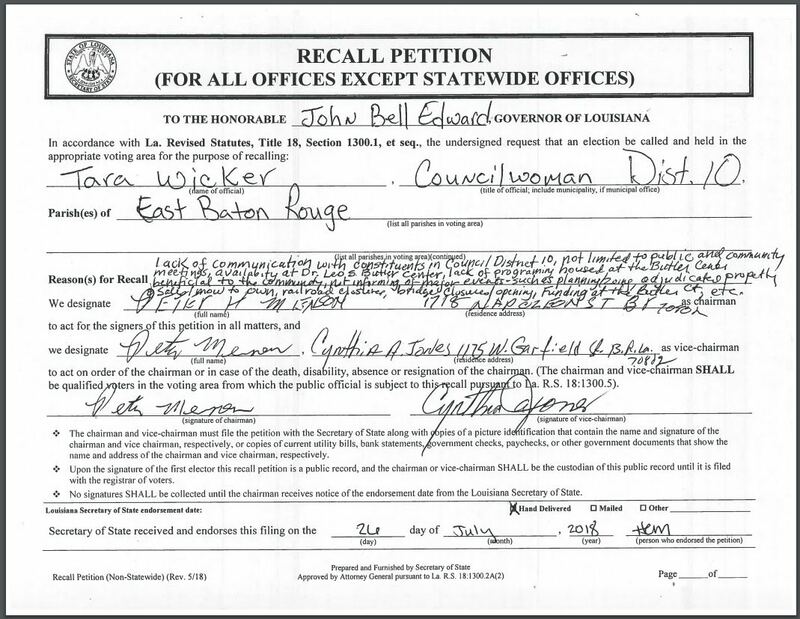 Organizers hand wrote various other reasons for the recall and incorrectly spelled Governor John Bel Edwards’ name in the petition filed at the Secretary of State’s office Thursday afternoon. Wicker was criticized by an audience at the council meeting last week when she went against other Democrats and helped vote Denise Amoroso to a temporary position on the council. Amoroso was selected to serve until an election to fill her husband’s seat after his death weeks before. Buddy Amoroso died after being hit by a car while cycling. In an interview with WBRZ last week, Wicker said those upset with her are in the minority. "I asked my staff, 'Have I gotten calls? Have I gotten emails?'" Wicker said. "There was a guy saying, 'Call Tara Wicker's office and call her out!'" she recalled. "Yes, please call my office so people can hear both sides of the story and what went into the decision I made. 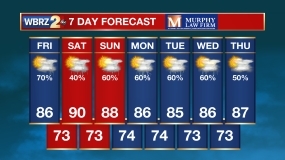 My staff said everyone who has called and emailed has been positive." Wicker said she was not worried about the contention the council faced. “If I believe in something, I'm going to stand for it even if I have to stand alone." "I had one African-American man call me and he said, 'I pointed to you to my grandchildren and told them that's what it looks like to do the right thing for the right reason,'" Wicker said. Late Thursday, Wicker released a statement: "It saddens me that things have come to this. However, my passion has always been about doing what is best for the people of Baton Rouge. That means what is best for all people. People of every color. I realize that some may not value my style of leadership. But if we truly want to be about the business of being one city we have to be selfless and loving. That is what I’ve done and that is what I will always do. I would like to focus on the business of the people of Baton Rouge. People of Baton Rouge, I love you all and will always do what’s best for all of our people. Now let’s get back to work. This will be my final statement on these matters." Petitioners have 180 days to garner signatures from 33 1/3 percent of voters in Wicker’s district before a recall election can be held. A recall prompts two elections – one asking voters to vote in favor of a recall; If a recall is approved, a candidate election follows. Successful recall petitions are rare and successful recall elections are almost unheard of. In this area, the most notorious recall ousted former Port Allen mayor Deedy Slaughter from office following a series of WBRZ News 2 Investigated Unit reports by Chris Nakamoto.